Our Mission – Open Scholar C.I.C. Research productivity is increasing at an unprecedented rate. Technological innovations, a surge in available computing power, and the ease with which digital information is stored and communicated is helping researchers to cross experimentation boundaries, to increase data availability, and to facilitate the transfer of knowledge. As a result, traditional research is being transformed into a dynamic and globally interconnected effort where ideas, tools and results can be made instantly accessible to the entire academic community. Although Institutional and multidisciplinary open access repositories play a crucial role by enabling immediate accessibility to all kinds of research output, due to a lack of incentives, scholarly communication and evaluation depends today primarily on academic journals. We identify the problem of journals and their publishers not on whether they offer free or paid access to their content, or on the quality of peer review they employ, but on the fact that they all treat knowledge as a material resource that accrues value from exclusivity. However, contrary to material market goods, the more knowledge is freely shared, the more value it obtains. It is therefore to the benefit of society and science itself that knowledge, in the form of scientific articles, is made available instantly and in all available means. 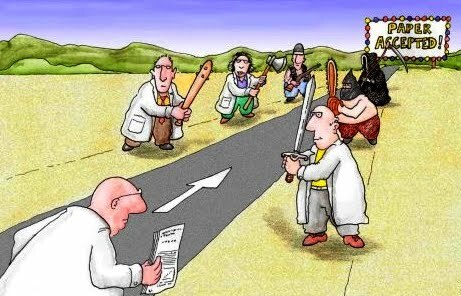 In addition, traditional journal peer review has been repeatedly criticized as slow, unreliable and susceptible to bias or even fraud. There is a growing conviction among scholars that science and society would profit from the scrutiny of original scientific ideas and results by the entire academic community whose collective knowledge is likely to result in more accurate and objective evaluations. Our organisation was founded to bring together all scholars who envision a future of open and transparent scientific collaboration that will benefit both science and the society in general. We believe that the journal monopoly over scientific assessment lies at the heart of today’s problematic model of scholarly evaluation and communication as it foments competition over collaboration. We propose a complementary, transparent open peer review process arranged and handled by authors themselves that can help dissociate research evaluation from academic journals. Journals can then play a different, but also important role of selecting and publishing articles that based on community assessment deserve a wider dissemination. At the moment, we run two main parallel and complementary projects. The Self-Journal of Science (SJS) is an open access repository that provides free services of peer review, evaluation and classification through open and verifiable community-wide processes. The Open Peer Review Module is a plugin that can be installed on top of existing open access repositories to enable the review of all hosted material. These novel, journal-independent, peer review approaches can be implemented in parallel to current academic publishing practices. There is no formal reason why academic journals should not accept to publish articles that have been previously openly and transparently evaluated by a number of experts. In fact, by adopting this strategy journals can reduce the risks associated to accepting articles based on a limited number of reviews by academics who do not have real incentives to be thorough and impartial. In parallel, we work on a theoretical level on issues related to open peer review, alternative metrics, science ethics, University ratings, and others. For more information read our thoughts on author-guided open peer review, read and sign our open peer review manifesto, and see our list of publications.